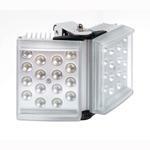 CBC WL500/120180 Ganz IR White Light Illuminators - Key Components - CBC Co., Ltd. The Ganz infrared and white light illuminators are designed to work in conjunction with any CCTV camera and fully functional dome including monochrome or colour/mono cameras. Both ranges incorporate surface mount, high output, high efficiency LEDs to deliver excellent night-time pictures with improved optical output and outstanding reliability.